The Michigan Coral Expo & Swap (aka Lansing Swap) will be on January 28, 2018. MCES is the largest reef event in Michigan...now in its 12th year! The event is hosted by two clubs...The Mid-Michigan Marine Club and Grand Rapids Marine Aquarium Society. Both clubs are busy making preparations and working on speakers and raffle to make it even better. Last year, MCES brought together over 950 hobbyists from around the state and upper midwest with 50 vendors from across the country. If you are a reef keeper in the midwest, you do not want to miss this event! Last edited by jimsflies; 01-26-2018 at 12:22 PM. Last edited by that Reef Guy; 11-14-2017 at 06:39 PM. Vendors from around the country come to sell coral (much of which are the amazing brightly colored corals that you see online). Last edited by that Reef Guy; 11-14-2017 at 06:35 PM. Not Only is this the Biggest Frag Swap in Michigan but it is also the Biggest Frag Swap in the Midwest and One of the Biggest Shows in the Entire World !!!!!!!! (The Only Bigger Single Day Frag Swap is in Connecticut). If you only go to one Frag Swap a Year this is It. You Definetly Do NOT Want to Miss this MASSIVE Frag Swap !!!!!!!! This GIGANTIC Show only Happens Once a Year. Last edited by that Reef Guy; 01-23-2018 at 05:07 AM. Here is the "Facebook Event Page" for the Swap. You will also Receive Updates and Reminders about the Swap if you Click "Going"
Last edited by that Reef Guy; 11-14-2017 at 06:36 PM. 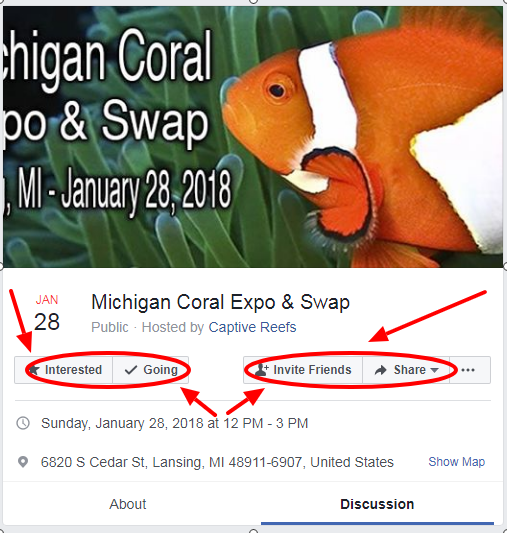 EVERYONE Please Remember to Mark "Going" or "Interested" on the Michigan Coral Expo & Swap (Lansing, MI) Facebook Event Page. It will help us get a good idea of how many people we should expect to come to the Frag Swap so we can plan accordingly. Also, Please "Share" the Event on Your Facebook Page or any Reefing Facebook Groups that you are in as it will Help Get the Word Out about this Awesome Frag Swap. Lastly, Please "Invite" any Reefing Friends that you have on Facebook. Click on the Facebook Link Above for More Info. Last edited by that Reef Guy; 11-14-2017 at 06:37 PM. This Frag Swap is Going to Be Awesome !!!! Last edited by that Reef Guy; 11-14-2017 at 06:38 PM. Motorcitycorals is super excited for this swap, we will be bringing some hot corals and awesome Raffle prizes. Serenade Corals llc is looking forward to bringing some great stuff this year!